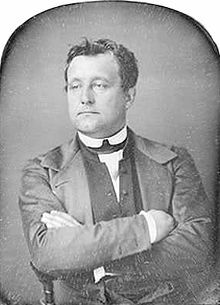 Jérôme Napoléon "Bo" Bonaparte (5 July 1805 – 17 June 1870) was a French-American farmer, chairman of the Maryland Agricultural Society, first president of the Maryland Club, and the son of Elizabeth Patterson and Jérôme Bonaparte, brother of Napoleon I. He was born in 95 Camberwell Grove, Camberwell, London, but lived in the United States with his wealthy American mother. Jérôme's mother's marriage had been annulled by order of Jérôme's uncle, French Emperor Napoleon I. The annulment caused the rescission of his right to carry the Bonaparte name; though the ruling was later reversed by his cousin, Napoleon III. It is speculated that Jérôme's prospective title is a reason the 11th Congress of the United States in 1810 proposed the Titles of Nobility Amendment to the U.S. Constitution that would strip an American of his citizenship if he accepted a title of nobility from a foreign nation. The amendment has never been approved, lacking the approval of only two state legislatures at that time. Charles Joseph Bonaparte (1851-1921), United States Attorney General and Secretary of the Navy, no issue. Jérôme Napoleon had refused to wait for an arranged marriage to a European princess, instead opting for the $200,000 fortune that Susan brought to the marriage. In an attempt to match the railroad heiress's dowry, the groom's maternal grandfather, William Patterson — one of the wealthiest men in Maryland — gave the couple Montrose Mansion as a wedding gift. Jérôme Napoleon Bonaparte died in Baltimore, Maryland, and is buried in the Loudon Park Cemetery, Baltimore. Wikimedia Commons has media related to Jérôme Napoléon Bonaparte. ^ Shannon, Selin. "Jerome Napoleon Bonaparte, Napoleon's American nephew". Shannon Selin. Retrieved 11 May 2016. ^ Marshall, Bill, and Cristina Johnston. France and the Americas: Culture, Politics, and History : a Multidisciplinary Encyclopedia. Santa Barbara, Calif: ABC-CLIO, Inc, 2005. "Jérôme Napoléon Bonaparte was born in England on July 7, 1805. Betsy and her son returned to Baltimore in September 1805. At Napoléon's behest, Jérôme married Princess Catherine of Württemberg in August 1807." - Page 162. Retrieved 22 November 2015. ^ "The "Missing Thirteenth Amendment": Constitutional Nonsense and Titles of Nobility". Thirdamendment.com. Retrieved 2012-03-08. ^ Lamb's Biographical Dictionary of the United States, Volume I, p. 341. ^ Gunning, Brooke; O'Donovan, Molly (2000). Baltimore's Halcyon Days. Arcadia Publishing. p. 75. Retrieved 15 July 2015. ^ "Maryland State Archives, Montrose Mansion and Chapel" (PDF). Retrieved February 25, 2013. This page was last edited on 24 September 2018, at 23:45 (UTC).